Do the Tigers have a legitimate shot to contend for conference title? Tennessee State opened up the season on fire a year ago before slowing down the stretch. This year the Tigers are predicted to finish sixth in the Ohio Valley Conference, a year after finishing seventh. Jacksonville State was predicted to win the OVC this season. The results of the Coaches/SID's Preseason Football Poll are below. Tennessee State turned Atlanta blue in 2017 opening the season with a 17-10 win over Georgia State. Victories over Jackson State and Florida A&M had the Tigers at 3-0 entering OVC conference play. The Tigers dropped five out of seven conference games to finish the year 6-5 overall but just 2-5 in league play. A pair of defensive backs were named Preseason All-OVC on Rod Reed’s defense. Vincent Sellers and Dajour Nesbeth. Sellers had 49 tackles and two interceptions returned for touchdowns in 2017. He was also a finalist for the Jerry Rice Award which is given to the top freshman in the FCS. Nesbeth had similar numbers with 48 tackles and two interceptions in 2017. You can’t mention Tennessee State with talking about Steven Newbold. He’s another Preseason All-OVC player who caught 34 passes for 627 yards and four touchdowns last season as a sophomore. The Tigers also return a solid running game with sophomore Sabree Curtis (439 yards) and junior Seth Rowland (423 yards). Treon Harris dominated the headlines last summer when the quarterback transferred from Florida to TSU. This season he will now line up at wide receiver for the Tigers. Michael Hughes will start the season at quarterback after taking over midway through 2017. Hughes passed for 1,304 yards with 15 touchdowns and a 53 percent completion rate. 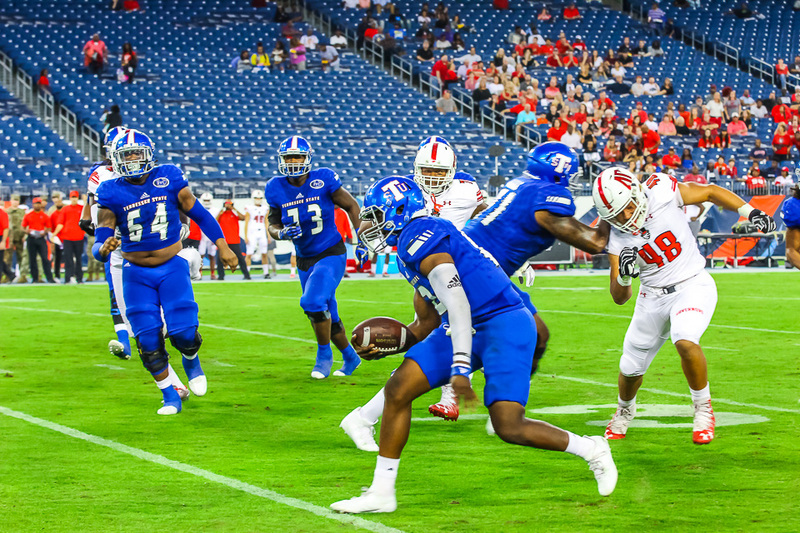 Tennessee State opens the season in Nashville on September 1 versus Bethune-Cookman. Jacksonville State opens the season in Montgomery versus North Carolina A&T on August 25. Bethune-Cookman (John Merritt Classic) Nashville, Tenn. (Nissan Stadium) 6 p.m.
vs Jackson State (Southern Heritage Classic) Memphis, Tenn. (Liberty Bowl) 6 p.m.
at Hampton Hampton, Va. 5 p.m.
Nashville, Tenn. (Nissan Stadium) 4:30 p.m.
Cape Girardeau, Mo. 1 p.m.
Nashville, Tenn. (Hale Stadium) 2 p.m.